For years, women around the globe have woken up and started their days with the ritual of applying makeup. They know that a single stroke of eyeshadow or a dash of lipstick can give them an unparalleled air of confidence and help them feel ready to take on the world. Burst Brushes knows this, too. It is our privilege to supply you with high-quality makeup brushes that will help take your look to the next level! Some find it a challenge to apply makeup, but we know that having the right tools for the job makes the process so much easier! Burst Brushes understands the value of your time, and so we offer a wide range of both natural hair and synthetic/vegan hair makeup brushes in our beautiful online store. Shopping is quick, easy, and can be done from the comfort and convenience of your own surroundings. Let us help you burst with confidence! Burst Brushes was started by LaReine Mulder, a professional makeup artist who has worked her way up from the humblest beginnings in this challenging industry. Her love of makeup has seen her working on movie sets, at SA Fashion Week, and even with Miss South Africa. Mulder saw an industry need for brushes that are affordable, of an excellent quality, and cater to everyone from the novice to the professional. “Burst Brushes are for people who love makeup and doing their makeup. I wanted to create brushes that trigger people’s imaginations and help them achieve their makeup goals — whether those are to create simple, wearable looks or to craft those high-end looks,” says Mulder. Our brushes are imported, handmade, and are of the highest quality. Each brush has been carefully designed to ensure that there is no streaking or “stabbing” by the bristles of the brush. The synthetic hair brushes are also finely tapered to mimic the qualities of a natural hair brush. All Burst brushes are double-clamped to both reduce shedding and secure the head of the brush to the handle. This ensures that our brushes are a long-lasting investment in your beauty routine. We offer everything from foundation brushes to lip and eye brushes, ensuring that every aspect of your makeup application is provided for. The many foundation brushes can be used to apply primer and a variety of foundation types. The contouring brushes allow for a controlled contour, to get that shadow perfect every time. The blush brushes can be used for contouring, applying colour, and highlighting to achieve a beautiful soft glow on the cheekbone. The eye brushes can be used for applying colour and highlights to the eyelid, and are specially designed for getting into the unique creases and grooves of the eyelid. The eyebrow brushes are designed to fill in any gaps between the brow hairs, and to create an exceptionally neat eyebrow. These hardworking brushes can also be used to apply gel and liquid eyeliners. Make your makeup goals and dreams come true! Simply select your brushes, make payment and have them delivered to your front door. 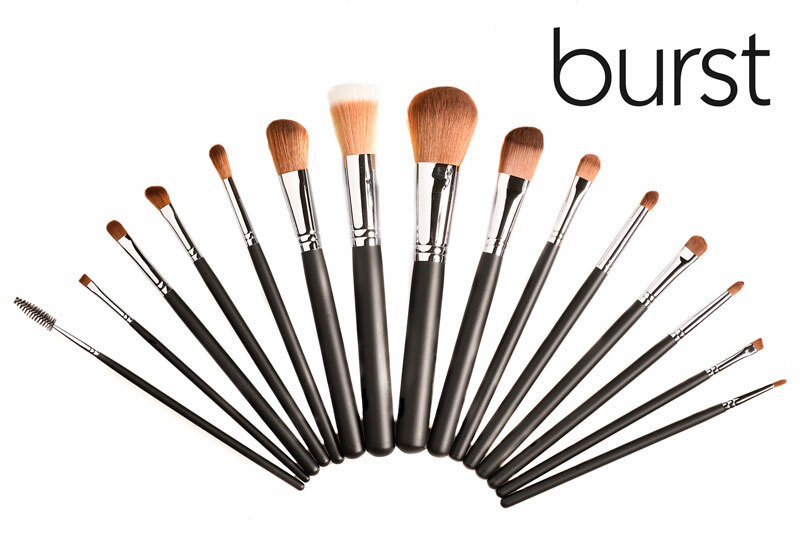 You can also find and follow Burst Brushes on Facebook and Instagram (@BurstBrushes) for a variety of makeup tips and trends, straight from the pros to you!